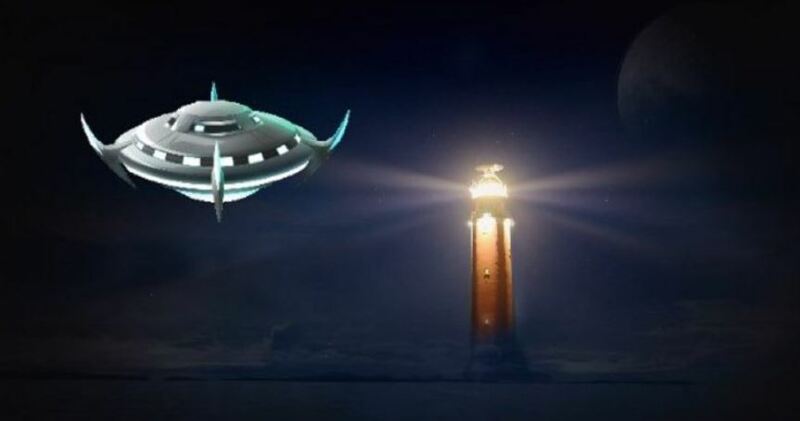 In October 1972 on the Isla De Lobos, a small island off the coast of Uruguay, situated where the River Plate and the Atlantic Ocean meet, one of the most intricately investigated close encounters in Uruguayan UFO history would unfold. The island is all but deserted save for a lighthouse which the Uruguayan navy maintain. It was during one such maintenance mission that a young corporal’s life was changed forever. It was just after 10 pm on 28th October 1972. Five navy personnel, Corporal Juan Fuentes, Jose Gomez and Hector Gimenez, along with the officer in charge, Francisco Cascudo and telegraph operator, Jose Lima, were playing cards following their evening meal. Fuentes checked his watch and excused himself to carry out his generator inspection duties. The generator units were near the lighthouse, opposite the barracks and living quarters of the men. As Fuentes stepped outside the lighthouse standing at over 200 feet looked down on him almost menacingly. Before he could take more than a few steps, however, strange lights on top of the generator roof, around twenty-feet from the ground, caught his attention. He stopped in his tracks, confused. To him, the lights looked like the headlights of a car. He backed up and returned inside. Without notifying any of the other men, who were on the other side of the building, he went to retrieve his pistol. He then returned outside and proceeded to approach the generator at the foot of the lighthouse. He could see now that whatever the object was, there were several lights of multiple colors of yellow, white, and violet. Fuentes continued forward, but slowly. He could see a “figure” at the base of the mystery object moving around. Then, he noticed a second figure making its way down to the roof from the object. Immediately after, a third figure emerged – this one taller than the first two. He would estimate the taller figure to be around six foot, while the first two appeared to be closer to five foot. It was then that all three of them suddenly turned around to face the approaching Fuentes. He stopped immediately. He was around thirty yards from the generator when the three mystery figures turned to face him. His first instinct, partly through fear and partly through his military training was to raise the pistol into a firing position. However, as he went to extend his arm fully, something stopped him from completing the motion. Fuentes would later struggle to explain what stopped him from doing so. He would describe a “vibrating” feeling in his arm as well as feeling paralyzed and unable to lift the weapon. Fuentes also recalled a strange, almost telepathic communication telling him “don’t shoot because it’s useless”. He remained where he was, noticing how the figures moved in a slow, bumbling manner. He would later recall thinking that the suits, which covered their entire body, must have been extremely heavy. This is a detail that is almost identical to the aforementioned Facchini case over two decades previously and on the other side of the Atlantic Ocean in Italy. He would also state that the figures had “elongated heads”. While this would perhaps fit with descriptions of gray aliens, it is more probable that it is a reference to some kind of head garment, probably part of the suit itself. After several moments, certainly no longer than a minute, the beings began to re-enter the craft, which itself had a distinct metallic quality to the exterior. As each of the figures went back inside the object it was obvious to Fuentes from the motions of their bodies that they were climbing some type of steps to do so. Then, the doorway closed with a sideways motion and began to rise directly upwards. When it was slightly higher than the top of the lighthouse a bright “fireball” shot from the underside and the craft vanished at breakneck speed. Fuentes remained for a moment watching the sky. Despite the ferocious speed with which the craft vacated the area, aside from a low “humming sound” the action was otherwise silent. Content that no other mysterious crafts were overhead, he returned inside. When he arrived where the rest of the unit was still playing cards all noticed how pale the young corporal was. And that he had a pistol in his hands. He informed them all of what he had seen. All of the men were dismissive of the sighting, although Cascudo quietly took in the details. While it isn’t certain, it would appear that Cascudo would pass on the report to a superior. Shortly after the incident, Fuentes received orders to report to a high-ranking military officer. This time, the details were meticulously recorded, and Fuentes’ account was treated with much more seriousness. So much so that two “special agents” from the American Embassy would speak to the high-ranking officer in an off-room immediately following his interview with Fuentes. They would then offer him several drawings of strangely shaped crafts and discs. He was asked to highlight which one was the closest to the object he saw. Then, the interest from the military and the American embassy ceased – at least officially. While Fuentes would tell of the account and the incident would be investigated by several UFO researchers, it remains unexplained. Of course, the fact that the American embassy would be interested in a sighting that officially the US government has no interest in is perhaps a telling sign in itself. NOTE: The above image is CGI. This entry was posted in ABDUCTION, best ufo photos, incredible ufo photos, MISSING TIME, top ufo news, UFO, UFO ARTICLES, ufo news, ufo photos, Uncategorized and tagged ABDUCTION, ALIEN CRAFT, ALIEN CRAFT LANDING, ALIEN CRAFT PHOTO, ALIEN ENTITY, ALIEN IMAGE, ALIEN IMPLANTS, ALIEN PHOTO, ALIEN PICTURE, AMAZING UFO PHOTO, BEST UFO PHOTO, best ufo photos, CAMERA CAPTURE UFO, CIRCLE LIGHTS UFO, close encounter, CLOSE ENCOUNTER UFO PHOTO, DISC, FLYING SAUCER, HIGH STRANGENESS, incredible ufo photos, ISLA DE LOBOS ALIEN, KEN PFEIFER UFOLOGIST, light photo, MISSING TIME, OCTOBER 1972 URUGUAY CLOSE ENCOUNTER, saucer, top ufo news, ufo, UFO ARTICLES, UFO LANDINGS, ufo news, ufo photos, Uncategorized | Tagged ABDUCTION by KEN PFEIFER. Bookmark the permalink.